I crested the ridge picking my through the scrub, pushing through paths of least resistance in the tangle of wiry hardwood brush, and there it lay below, a remarkable meadow. The grassland covered a sloping depression which was enclosed entirely by chaparral and accented by two large coast live oak trees. Walking through the grass of the meadow some minutes later it was evident that this field was an exceptional tract of land like few if any others in the vicinity. This was not an average dry meadow or potrero thinly covered in wild oats, star thistle and skinny grasses and floored by hardpan. The grass, whatever it’s make up, I’m not sure, thickly covered the soil in a dense mat and my feet didn’t feel to be plodding on solid earth, as is the case in most fields I’ve walked across in the backcountry, wherein each footfall stomps the grass firmly down flat against the ground. The grass was so dense it kept my feet well above the soil on uneven clumps and tufts. I had to tread carefully to avoid twisting an ankle. Despite so little rain in this fourth year of what may be the worst drought in California in 1200 years, and despite the unusually warm winter which at times had felt like summer, the forage was still, amazingly, tinged green and showed no signs of thinning to reveal bare dirt. Grassy fields elsewhere were already dead brown. Clearly the underlying soil was thick and nutrient-rich and held a remarkable amount of moisture. The north and south sides of the field sloped toward its center and into a slight crease where rainfall naturally funnels. There in the center the grass was especially thick and even greener. In years of abundant rainfall it may be a boggy spot. From that spot there meandered a foot to two foot wide channel carved by flowing water, but which was dry. It led from the meadow, between hills, and turned into a small creek. I walked over to the largest of the two trees, a skyscraper of an oak, rising unusually straight upward from the soil before branching out high overhead, lush and full and apparently enjoying an uncommon supply of water and nutrients. Sitting in its shade I scanned the meadow admiring how exceptional it was, how were I a pioneer back in the day I would of been keen to build a homestead here and “prove up,” where it not so far from a reliable water source. Although that problem may have been mitigated by the digging of a well and collection and storage of rainwater during winter. I daydreamed about returning to camp there during wetter times. I dug through a foot of crispy oak leaf mulch, down to the soil to level a spot for my stove to brew coffee and boil soup for lunch. A rich organic fragrance hit my nostrils as soon as I exposed the dirt and instantly brought to mind chanterelle mushrooms. Having foraged for wild fungus for years in the Los Padres National Forest, the sweetish scent of good soil never goes unnoticed to me in the woods. I glanced up and scanned the immediate area around me analyzing it, looking for softball-sized mounds of leaf mulch pushed up by mushrooms hidden beneath. They would have been dry by then and worthless, as it hadn’t rained in many weeks, while the weather had been exceptionally hot. There were no signs of mushrooms, but judging by the scent of the dark soil it seemed to have had the qualities to support an abundance of edibles in wetter years. The symbiotic relationship between chanterelles and coast live oaks may be another reason why the tree was so large and healthy looking. I was shocked to find that the soil was still moist. The hills around me were cooking, sage brush having barely the rain needed to sprout but little new growth. In some areas sage leaves were already shriveled and dead and it was only early April. Many creeks had not run for more than a day or so if at all for the last several years. Yet here, in this rarely visited meadow without a trail, the soil was moist, fertile and thickly covered in dense green grass. I grabbed a palm full of soil and inhaled deeply of its rich earthy fragrance. How I love that smell. Squeezing it tightly the soil clumped together into a clod lined with the imprints of my fingerprints due to its moistness. This place, these details, they may be of no import to anybody else and tedious to read. If they even hold one’s attention at all in this age of microwave oven immediacy and short attention spans. To me, however, this meadow is of great interest for various reasons, some mentioned above and some not. 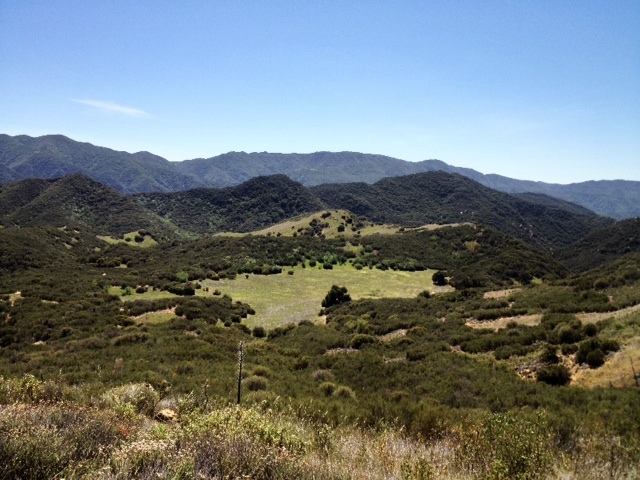 The general point here is that there are or may be places out in the depths of the Los Padres National Forest that pique the personal interests of hikers for a wide variety of reasons, and which they have no idea exist. On a topographical map these less visited wild places may be nothing more than contour lines, places without names nor labels, and unnoticeable on even the best maps covering Santa Barbara’s backcountry, well-crafted by local cartographer Bryan Conant. They may be unmentioned in the best guidebook to hiking the Santa Barbara backcountry, well-written by local author Craig R. Carey. These places may even be unremarkable or unnoticeable when viewed online with satellite imagery and may be unknown or never written about nor mentioned even among the more experienced hikers, backpackers and campers of the region. Hidden in plain sight this way, preserved in perpetuity by law, they are out there waiting to be discovered. If only one may spend the time and effort, and seize the opportunity, to explore the lands of their natural heritage and stumble upon them. One never knows what they may find in the forest if only they look. 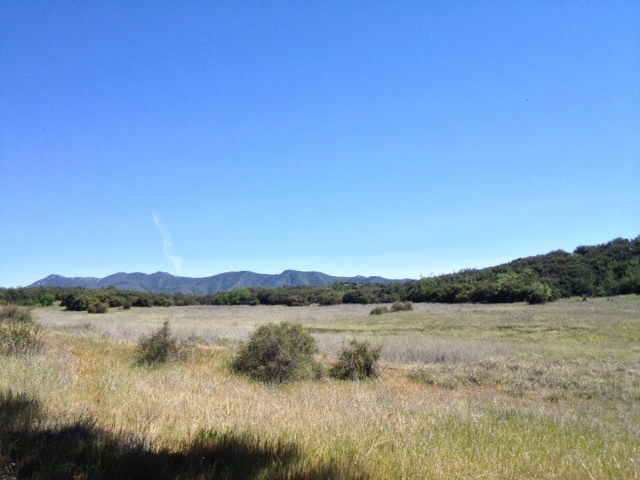 This entry was posted in Santa Barbara County and tagged backcountry, Backpacking, Camping, Hiking, Hiking (2), Los Padres National Forest, Nature, Pics, Santa Barbara, Travel, Wilderness. Bookmark the permalink. Thank you so much for this eloquent description of what would seem to be an impossible meadow with green springy grass in the middle of drought, and rich, moist fertile earth, and earth smell. I am entranced. These are the moments for which we go out there in the first place. Well done. The “meadow”, locally known to old timers as “________ potrerro”, drains to the west into a no name (also known as ___________) creek made famous by bothers who built a hunting cabin above the waterfall. To the east in the ___ ___ of _____ creek the last vestige of the purest genetic stock of Oncorhynchus mykiss remains stranded. Thanks for commenting. You’ve taught me a thing or three in the past. But I don’t think we’re talking about the same potrero. I edited your comment in addition to your initial blanks in order to protect the fish. I was up in the creek officially known by the same name you mention about two weeks ago and saw some trout in the tiniest of pools. Good to see in these dry times. However, this potrero does not drain into that creek. The creek you mentioned by name is quite close to this potrero, but it seems odd to me that two creeks so near each other would be known by the same name. On the other hand, there aren’t many potreros out there. Especially not in this particular area, which it sounds like you obviously know. Maybe local old timers know this field by that name, but then the same name was then later officially applied to a different but somewhat close by creek. Or perhaps the name was initially given to that close by creek but to locals the other creek draining the portrero was instead called by that name. Not sure if all that makes sense, but now I’m curious. “Escondido potrerro” could be interpreted as the flat spot, about 70 yards across, right there by the “no name” creek, very near and below the water fall. From there, one can hike up into the meadow seen in your shot via the small drainage below the ridge due east where there is a spring by the sycamore tree. This drainage is the outflow of your meadow and flows most years. Most consider this general area, your meadow to be “Escondido potrerro”. The reasoning is your meadow was known to be the place where Dad Ramsey had a small homestead, in place known as “Escondido Potrerro”. He was a bootlegger and supplied the hunters heading into the mountains from Carpinteria from a still he had hidden by the creek (in the other drainage further east previously mentioned). Nice. Thanks for the follow up! I know exactly what and where you’re talking about now. Very interesting historical tidbits. Glad you bothered to mention it all! I think I’ll make a post of it if you don’t mind. Good stuff. Interesting. . .I had previous read that Carp Historical Society newsletter but totally forgotten the bit about Ramey. What had caught my eye was the mention of a “Honeycomb Falls” and I had wondered where that might be located. By the sounds of it this waterfall is the one you have mentioned. I assume the name for the falls was taken from tafoni formations on the rock. ? And so thanks again. You also unknowingly answered my curiosity about Honeycomb Falls. Very cool.